Blazer is part of CCI's budget line of training and range ammo, and is available with either an aluminum or brass case. 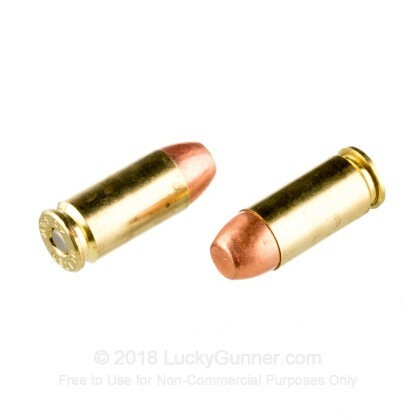 Both perform really well, but if you reload or have particularly picky guns, the Blazer Brass is the way to go. All Blazer ammo is made at the same facility in Ohio where Spear, Gold Dot and other high quality CCI products are produced. For this test, we shot Blazer Brass 165 grain in a 40 Smith & Wesson. Accuracy was pretty good, which you can see from our 10 shot group that we fired from a bench at 15 yards. Rounds were going a little high, except for that one flyer. This was shot with a P226, so the point of impact might be a little different in your gun. 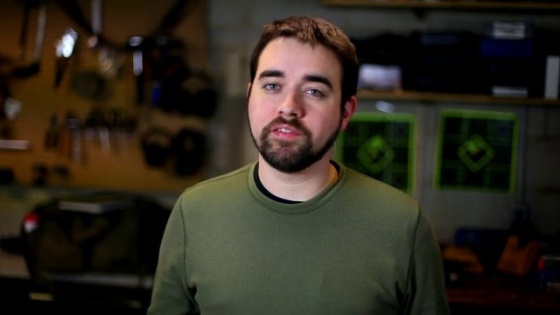 Reliability was great, and to be honest, kind of boring and predictable. So boring in fact, that we decided to see how many soda cans we could penetrate with a single Blazer bullet. According to our non-scientific test, the answer is at least four. 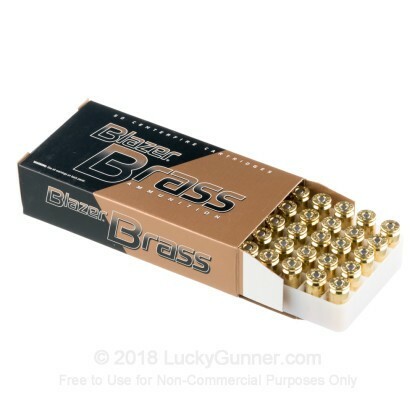 Blazer Brass is a great low-cost range ammo, and I found the casings to be especially good for reloading. So if you want American-made, reliable ammo that won't break the bank, then try out Blazer. Never thought much of it. You typically shoot paper targets with cheap ammo since there is no sense in using the expensive stuff to put holes in paper. While in a training class, and firing rounds at targets within "bad breath" distance, My instructor noticed a piece of shrapnel lodged half way through a paper target. Everyone smiled and thought of it as an interesting fluke and carried on the class. However, once it came to barricade shooting and I was shooting through small openings (3"x10") I found a lot of that shrapnel sticking into the wooden barricade and some bouncing off of the cutout catching me in the face. I am not a ballistician, just an average Joe but seeing how none of the class nor my instructor (Marines, Cop, S.W.A.T., Owner) had never seen it, I am sure it's not a desired performance. Tried it in three Guns same results. Gonna have to be "wow'd" to get me to use this brand again. Use this ammo all the time in a Glock, works well. Delivery as usual was fast. Fast shipping, ammunition performed flawlessly. Used it in a self defense course, put about 250 rounds downrange from a Glock 23, no issues, excellent accuracy. Shoots clean with no feed problems on either my P-226 or P-320 at all. Will re-order and recommend to others. Cudo's to LuckyGunner also with extremely fast shipping. That Fedex man needs to wear a back brace soon though with as much ammo i go through. 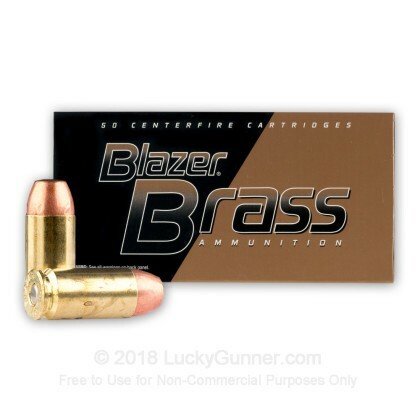 Blazer brass ammo is the same from one store to another. The difference is I have waited up to 10 days from other websites to receive my order. I received my order from Lucky Gunner the next day. I'm sure part has to do with I'm in a neighboring state . But that is very fast shipping anyway you look at it. 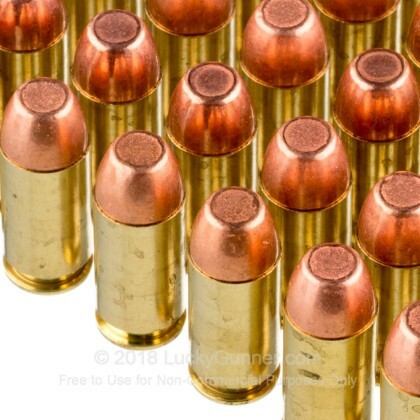 Great ammo, I use it for paper, steal and my run and gun training. Like I've said before I've shot thousands of rounds of this ammo through M&P 40, Walther PPQ M2 and a Smith & Wesson Shield without ONE problem. Heidi and the team at Lucky Gunner are Great and have it to me fast usually in two days every time. I have nothing but good things to say about Lucky Gunner. I would like to see them stay a touch more competitive with their prices though, because there is some good competition out there. I like to see the competition because it keeps the price down when companies compete for business. The whole experience was flawlessly perfect. My first order from lucky gunner and everything went smooth from the order to delivery. 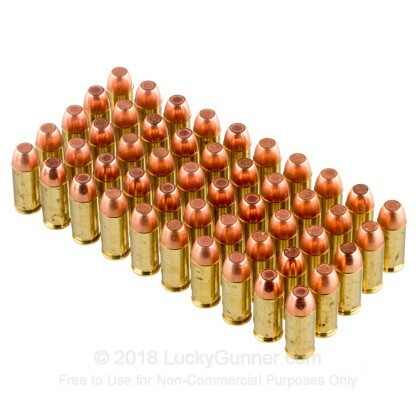 As for the Blazer Brass ammo, it was well packed, and visually exactly what you'd expect new never fired ammo to look like. My 23 Glock fired a fifty round box without a single FTF, something that I was a little concerned about since 180 grain is the recommended bullet. This is great target ammo and I will definately purchase it again, and I will most definately purchase from lucky gunner again. Great ammo for the price. Pretty clean and performs well. Good, clean ammo, and delivered quickly! Consistent quility at a great value. The Blazer ammo provides consistent quality at a great price. I used this ammo for target shooting and found it to preform very well no misfires and shells ejected properly. It's made in America so no issues at the range. good for IDPA competition shooting, great delivery from Lucky Gunner, and good price. 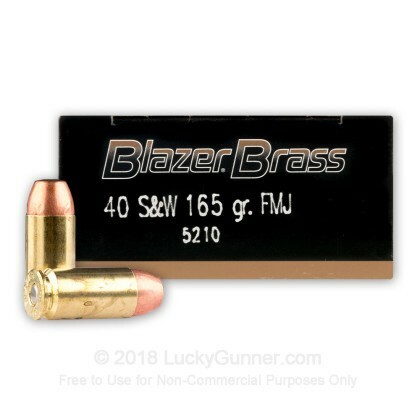 We also have this 40 S&W - 165 Grain FMJ - Blazer Brass - 50 Rounds ammo in stock in a smaller quantity.